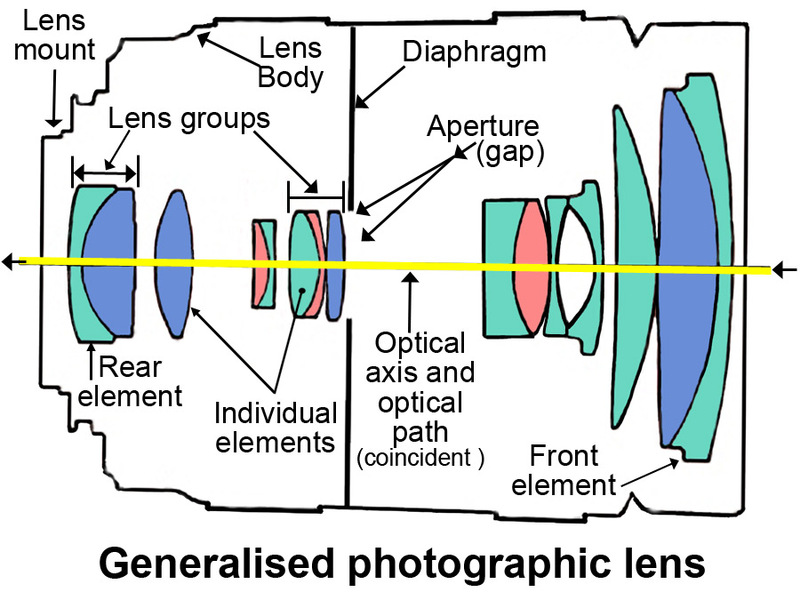 In a modern photographic lens, there is usually more than one individual glass optical lens. Each glass lens is referred to as an “Element” or “Lens element” of the photographic lens. In some photographic lenses there will be many individual glass elements arranged in groups. Each lens element does a part of the overall shaping of the light which contributes to the final image projected onto the digital image sensor. The front and rear lens element can be seen and touched. They are the most vulnerable. They need to be looked after. Always use a lens cap on each end of the lens when it is out of use. Make sure that both ends are clean at all times. Use only chemicals recommended for cleaning lenses. The front and rear lens element is usually coated with a special coating to reduce flare and other forms of aberration. Be careful not to rub the lens too much or allow it to touch rough surfaces. These can mark the coating, or even the lens below it. 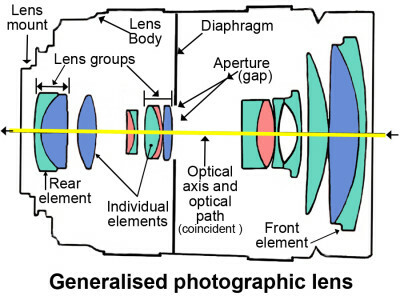 Generalised photographic lens layout showing showing the principle features. Each of the glass parts are lens elements.